Happy New Year! 2017 was not a great year for content here on Naturalla Beauty, but I want to do better in 2018. As you may know, last spring I switched from mainly freelancing to working full-time again and I currently work two jobs for a combined total of six days most weeks -- not including the freelance work I still do on the side. I don’t think I ever gave enough credit to bloggers that also work full-time, but really, there’s just not a lot of hours left in the day after full-time work + a commute! Nonetheless, despite a still-hectic schedule, I’ve missed blogging and I want to make a point to do more this year. I’ve got lots of great content planned and I’m hoping to set up a more regular routine. And, that starts today. I was pretty restrained on Black Friday, but my one spur of the moment impulse buy was the 100% Natural Skin Renewal Kit from Consonant Skincare. 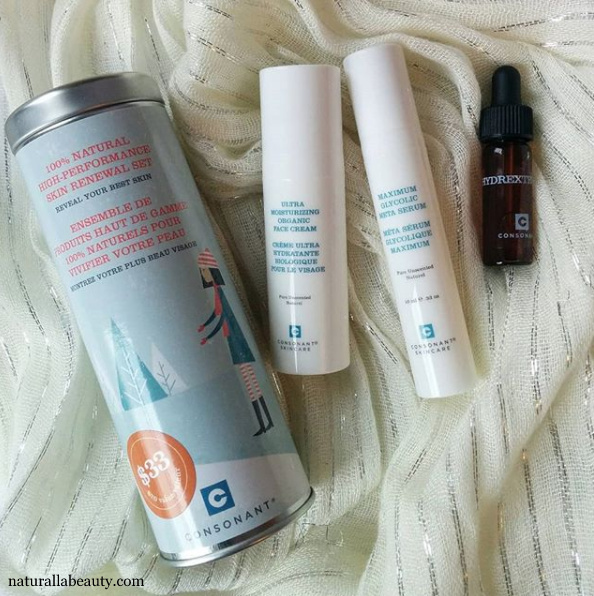 Consonant is a Toronto-based company that makes natural, high-performance skincare. The brand takes a scientific approach to formulating and creates healthy products without synthetic ingredients or skin irritants. Most products are unscented and everything is designed to function in harmony with the skin’s natural chemistry. The Skin Renewal Kit was a limited edition set for the holidays and included small sizes of the brand new Maximum Glycolic Meta Serum, the award-winning, cult favorite, HydrExtreme Extreme Hydration Booster, and one of two moisturizers: the Ultra Moisturizing Organic Face Cream or the Ultra Moisturizing Organic Face Cream for Dry Skin. The kit is currently sold out, but the products can be purchased individually, both directly from Consonant and on Well.ca. Let’s get right to the review! Here are my full thoughts after using these three products for the last month. The ingredients are fabulous, but it’s a light product, and, on its own, I don’t feel like the Ulta Moisturizing Face Cream offers enough moisture for my skin this time of year. I do, however, like it as a base for cocktailing skincare. Most often, I’ve been mixing in a drop or two of a face oil or blending in some HydrExtreme for adding moisture and/or hydration. I feel like the cream alone would do the trick for me in the summer, when my skin typically need lighter products, so I may end up saving the rest until the weather warms up in a few months. HydrExtreme is a hydration booster that regularly garners raves from bloggers and traditional media alike, and it’s a product I’ve been curious to try for years. Made with just two ingredients, cassia angustifolia seed extract and vegetable glycerin, HydrExtreme is a hydrating serum that’s been found in independent double blind studies to outperform traditional hyaluronic acid formulations. Cassia angustifolia, or senna, is best known for its use as a laxative, but it also has skin conditioning benefits and anti-inflammatory properties, and offers improved skin hydration, moisture and suppleness. Glycerin is a natural humectant, meaning it attracts and binds to water, helping skin draw in and hold onto moisture. HydrExtreme has a thin, watery consistency. It can be applied on its own, layered under other products, or mixed into a cream moisturizer. The last way has been my favorite method of using the booster. It’s hard to get a single drop of liquid to spread across your entire face, but that’s all that I’ve found my skin really needs, so mixing it into a cream is a great way to make the most of the product -- and to conserve this 4 ml baby size and help it to last me a little longer! At $72 for 10 ml / $149 for 30 ml, HydrExtreme is Consonant’s most expensive product, but it works very well, lives up to its claims, and, unless your skin is ultra, ultra dry, you don’t need a lot. Like I said, I only add one drop into my moisturizer, once a day, and I’ve seen a noticeable difference in both the hydration and plumpness of my skin, so a little really does go a long way. The Maximum Glycolic Meta Serum is a new product to Consonant’s range, launched just last month, and is the item that I was most excited to test out. The serum is made with the maximum allowable concentration of AHA’s -- thus the name -- to exfoliate and break down dead skin cells, and it also contains soothing botanical extracts and hydrating sodium PCA and niacinamide to counter any harshness from the acids, minimize irritation, and prevent dryness. I’ve never used a glycolic acid product before, so I cautiously started out using the serum only twice a week and have gradually worked up to nightly use. The Glycolic Meta Serum is considerably thicker than the HydrExtreme and has more of a gel consistency. It applies smoothly, absorbs quickly, and is very gentle. I’ve had zero irritation, tingling, or burning, all of which I’ve experienced with other acid products in the past. I didn’t see a lot of results immediately, with more infrequent use, but by the time I worked up to every other night, and later every night, I could see a tangible difference. My skin is more even and it's incredibly soft to the touch, with very little texture remaining at all. The serum has also left my pores looking cleaner, and thereby smaller and less visible. The kit was a great way to try multiple products and I’m really glad I picked it up! The moisturizer hasn’t blow me away -- although that might be different in the summer -- but both the Hydrextreme Hydration Booster and the Maximum Glycolic Meta Serum are products I’d consider purchasing in full size once I use up these minis. i LOVE their foaming face wash. foaming soaps tend to be drying, but this one isn't, at all - when i use it, my face feels clean and soft, not tight and dry like with some other cleansers. i can't speak to how well it removes makeup, because i primarily use it in the morning, and even when i use it at night i remove makeup with a cloth first, but it's a great cleanser and i've already repurchased it at least twice. i'm currently using the hydrexteme, but i don't really notice any difference -- however, i might just have pretty decent skin already because i rarely notice products performing particularly well. i've also used the body wash (unscented, so nothing special but it works fine), the DHE mask (liked it at first, but as my tube got older it seemed to get harder to wash off), and a sample of the face cream. i've recently started getting into glycolic acid serums, so am definitely interested in trying it out once i use up what i already have. You could be right about HydrExtreme -- I think if your skin isn't dehydrated to begin with, you might not notice much difference. I usually add in a hyaluronic acid serum this time of year anyways, so it's filling that same spot for me. The Glycolic Serum is great -- if your skin already does well with glycolic acid, I think you'd enjoy it.